From left are Grayden Edwards, Nathan Pinson and Mason Carroll. 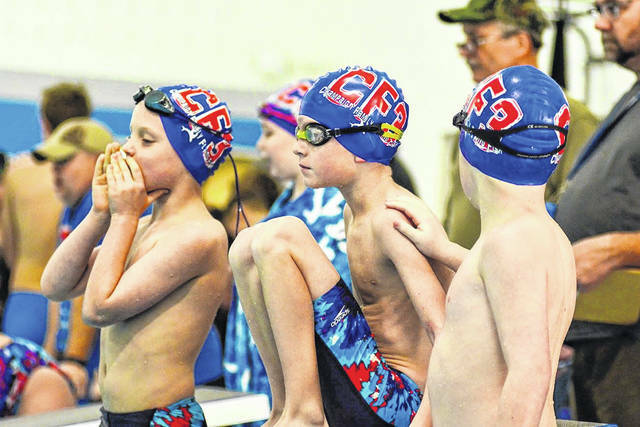 The Champaign Family Flying Fish winter swim team is entering its fourth season and is eager to continue growing. After doubling in participation last season, the team knows there are big things on the horizon. The Flying Fish pride themselves on accepting swimmers at all experience levels – brand new to the sport or with years of swim team under their belts – and strive to make swimming approachable for everyone. They encourage swimmers to participate in other extracurriculars as well. In fact, many of their participants compete in other sports and take part in activities alongside swim team. They aren’t looking for Michael Phelps, just enthusiasm and a competitive spirit. The Flying Fish high school group is a particularly unique and exciting part of the program. Urbana High School is the only area high school with a varsity swim team. In order to fill this gap, the Flying Fish offer an opportunity for kids who want to compete for their high school in swimming. Students practice with the Flying Fish team, have a meet schedule set up for them, and are provided with two highly qualified on-deck coaches at meets. The Flying Fish strongly believe in nurturing school and community spirit, and they are excited to give even more students the opportunity to try something new and compete for their school. The team competes in the Southwest Ohio YMCA Swim League, with the season running October-March (high school runs November-February). Children ages 5-18 are encouraged to participate. For families that have never participated in swim teams and are unsure what to expect, there is a free trial week Sept. 24-30. If you don’t think your child is ready for swim team, the YMCA offers monthly swim lessons that will teach your child the technique needed to be successful in swimming. Contact Chelsea Richardson at ymcasports@ctcn.net with any swim team or aquatics questions.